Luxurious lambswool Irwin tartan Rug. 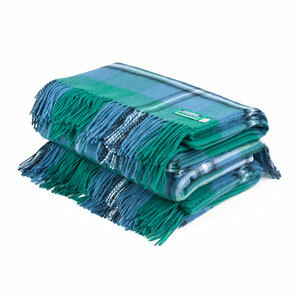 Ideal for special occasions or use as Tartan Throw, Knee Blanket, Travel Rug. A lovely gift or spoil yourself. We think it's the only Irwin Lambswool rug in the tartan universe. Get one. Made in Scotland. JUST ARRIVED, Limited inventory offered on a first-come first-served basis. 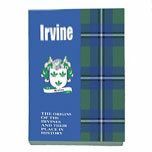 Made to order in Irvine tartan, fringed all round. Popular wedding gift. 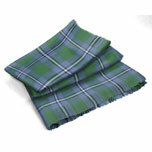 Supplied in Pure New Wool fabric, in mediumweight. NOTE: Joins may be necessary if your particular tartan variant is only available in Narrow Width (76cm, 28-29 inches) or if LONGER or WIDER throw size required. 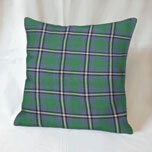 Tartan cushions made in Pure New Wool tartan. Piped. Standard size 16 in x 16 in (40cm x 40cm). Email us about larger size 18in x 18in (45cm x 45 cm). Made to order in Scotland. Allow 4 weeks. Can be ordered without the filler for cheaper shipping. We offer a buy 3 get and 4th Free on this product. But please contact us when ordering. 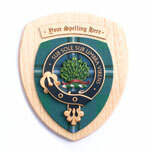 Display your clan's crest, with the approved clan badge beautifully carved and mounted on a swatch of the clan tartan. Made to order in Scotland. Completed with your choice of spelling, version of the surname. Allow 4-6 weeks. FOR more CLAN CRESTED items like Pendants, Pins, Cufflinks, KiltPins, Tartan Rosette Brooches, Scottie Dog Brooches etc see Small Accessories, Jewellery & Brooches Section. The origins of the Clan and their place in Scotland's history, carefully researched with both factual and mythical references by well known Scottish authors.